I have a really good memory. Colors, smells and sounds sometimes bring a rush of memories and feelings at the most unexpected times. All of a sudden I will be lost in the memory, like a time machine transporting me, back to a younger, more carefree time. How to make the “swirl” video. I remember the first time I tasted Butternut Squash Soup with Toasted Cashews was Aspen, Christmas, 1991, at a restaurant called The Attic. It was the same restaurant we’d eat at every Christmas, but this night, as part of the prix fixe menu, I tasted Butternut Squash Soup. I could have stopped there, skipped the Prime Rib, the Yorkshire Pudding and the English Trifle. As soon as we got home, I recreated that soup, and now it’s on my Autumn/Winter soup list every year. It’s rich, it’s elegant. Perfect for Thanksgiving or as part of a dinner party. Best of all, making the butternut squash soup is simple. Well, I think all soups are simple…and way tastier than anything in a can. The original version was thickened with a roux (flour and butter), but I have found that if you reduce the amount of liquid, the squash will thicken the soup fine on it’s own. The original recipe also used heavy cream, I use half and half to give it richness and body…just enough to bring it to the right consistency, but still keep it healthy. 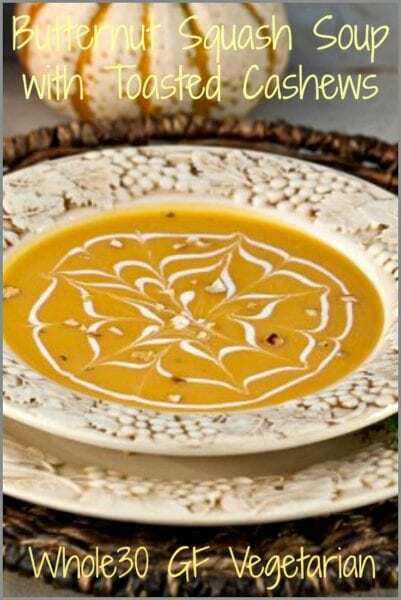 Have you ever eaten butternut squash soup? What do you think of it? 1 medium butternut squash about 6 cups cubed. Halve squash and place cut side up in a baking pan with 1/2" of water. bake uncovered for about 45 minutes. Squash won't be fully cooked, but slightly tender. Cool.Using a vegetable peeler, peel of outer skin and scrape inside to remove seeds and stringy fibers. Cut into cubes. Should yield about 6 cups. (I think you can actually cheat on this and get pre-cubed squash in the produce section of your market). Partially cooking the squash before peeling makes the job much easier. Butternut Squash Soup with Toasted Cashews is gluten free. Butternut Squash soup with toasted cashews. Thanks Melissa! I appreciate it! 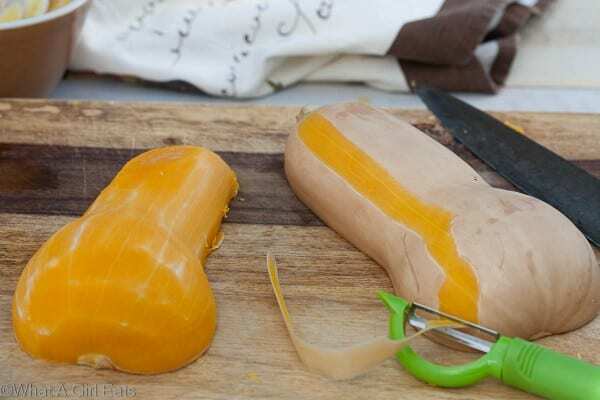 I don’t really cook with the butternut squash because I don’t know how to use it. This looks like a great recipe! I have to give it a try! What a great recipe, good idea with toasted cashews, thanks for sharing. This is one of my favorite soups. I like to use a little yogurt that plays of the sweetness of the soup – a perfect combination. A+ for your presentation. 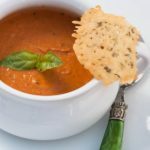 Delicious soup great for fall, Thanks for sharing with Hearth and Soul blog hop. pinning. The toasted cashews here have to be great! Looks like a wonderful creamy soup. Sounds great! I love food memories. This looks so delicious! And your photo is beautiful too! I have a butternut squash ready to go too…I just added a shallot and thyme to my grocery list! Can’t wait to try this! Thank you so much for sharing it with us at Foodie Fridays! I’ll be sharing it on my Facebook page tomorrow! Oh, I’m just seeing this! I will stop by! Thanks so much! Yes! I still have his scribbled recipe on a sheet of paper. I adore homemade soup, there’s nothing better on a cold Autumn evening, this looks wonderful! Cannot believe it’s almost Fall and soup time! I love soup time. Awesome tip about cooking then peeling the squash! That part is always challenging for me. Beautiful presentation here too! Absolutely gorgeous! And I love the addition of the toasted cashews! Thank you! I think the cashews are key to the flavor! Wow, that is incredible that the chef shared his recipe! I am never as fortunate, lol, so I’m usually left to my own devices entirely when I try to recreate a dish. This looks incredible and I will definitely be making it this holiday season. And your photo is gorgeous – truly magazine-worthy! I have attempted to make something like this before, but mine turned out bad. I think I will try your recipe and see how it tastes then, you recipe looks a lot better than mine did. I’ve pinned your beautiful soup. 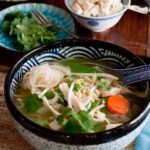 It looks and sounds delicious and you’ve presented it so elegantly (side mention: LOVE your harvest soup bowls and plates!!). So about how many people would this recipe serve and how much cashews did you toast beforehand for the garnish? There isn’t much better in life that a bowl of homemade soup on a cold Autumn evening; this looks delicious! Lovely soup, and I love the cashews in this, great idea. Love how vivid your memory is! And can totally agree sometimes a sound, scent, etc can completely transport you back in time! Also love that you asked the chef for the recipe – I always shy away from doing that, but really need to when I find an awesome dish! Wow … that’s wonderful that the chef was willing to give you the recipe, even if it did feed 200. 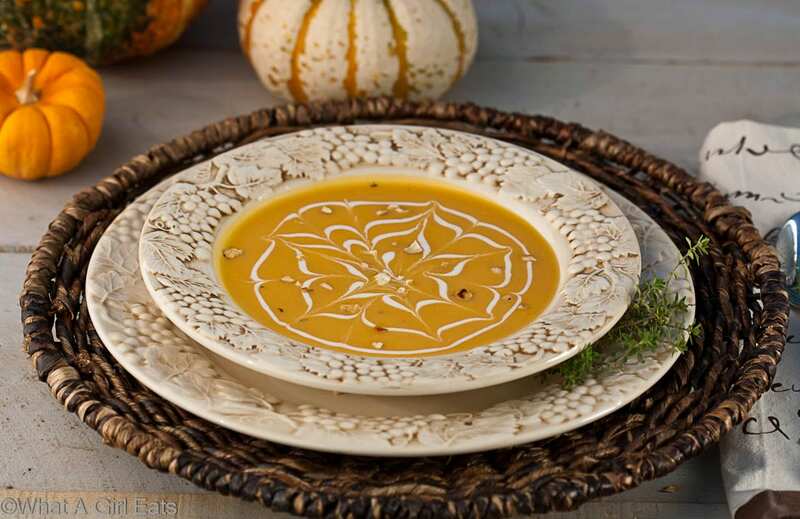 This is the perfect soup for fall – yours looks absolutely stunning! You had me at toasted cashews but this soup does look so lovely and comforting. 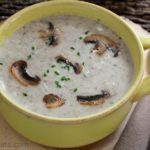 Perfect winter soup! This is so beautiful, I love how you got the cobweb design with the heavy cream. That’s some talent! This soup looks so good and that swirl is just beautiful! This soup is perfect for fall! Can’t wait to try it! Such a great fall starter! Love butternut squash soup! So yummy with those toasted cashews and perfect for the fall season. Isn’t it? Even the color is perfect! What a simple, beautiful recipe! I’ve been eating a lot of blended soups lately, but haven’t done one with butternut squash yet! Ohh the cashews are a lovely addition! My kids will love this soup! I just made some butternut soup last week! It’s perfect for this time of year. I agree! It just screams fall! This looks perfect for the Fall! I love the addition of the crunchy cashews. It seems just like the perfect fall soup…even the color is right! Butternut Squash soup is such comfort food during this season. We love to add bacon bit on top for extra crunch. So good! 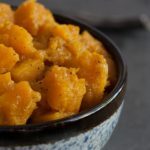 Ok, you’ve convinced me that I have to go to the grocery store tomorrow to pick up a butternut squash to make this recipe. It sounds so delicious, and I can’t wait to try it! Love the story on how you got the recipe too. You can even get it already cubed! Glorious recipe! Just sent a reader over for this recipe! It’s a winner!